Ireland make one change for the Women's Six Nations game against Italy in Parma on Saturday. Coach Adam Griggs has awarded scrum-half Kathryn Dane a first Test start in place of Ailsa Hughes. Fit-again prop Lindsay Peat and back Laura Sheehan are on the bench for the first time in this tournament. Flanker Claire Boles, who made her Ireland debut as a replacement last time out against Scotland, starts again on the bench. 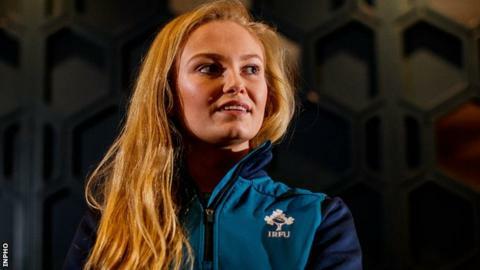 Like Dane, she is a native of Enniskillen and hopes to bring her Sevens experience into the Test arena. "It was good to get the win on my debut and definitely there are a lot of skills that are transferrable [from Sevens]," said Boles, who starts Saturday's game on the bench. "But it's a totally different experience. I'm really enjoying it." Boles, a third-year chemical engineering student at UCD, made her Sevens debut in 2017. She is being mentored by two of Ireland's most experienced players. "I play in the back row, so you've the captain Ciara Griffin there and then Claire Molloy, who has a lot of caps and has great experience. "Not that I've forgotten, but placement-wise I need to double check because I haven't played there for a long time. They would be like 'yeah, go here' and give me a bit of guidance." Ireland moved on quickly from the 51-7 drubbing by a fully-professional England line-up in the opening round by beating Scotland at Scotstoun. Boles said: "It was definitely an important game for us. It was kind of like win or nothing, if you know what I mean?" "We had to bounce back. It was a tough one to come back from [the England defeat] but the girls dug deep. "There are good vibes in the camp, but Italy did beat Scotland as well, so we will have to be prepared this weekend. "They are good at executing. They are good in possession. Our defence will definitely have to be up to the test." Ireland (v Italy): Delany; Considine, Naoupu, Claffey, Miller; Fowley, Dane; Feely, Hooban, Lyons, A McDermott, Fryday, Caplice, Molloy, Griffin (capt). Replacements: A Bhaird, Peat, Reidy, Boles, McLaughlin, Hughes, Murphy, Sheehan.